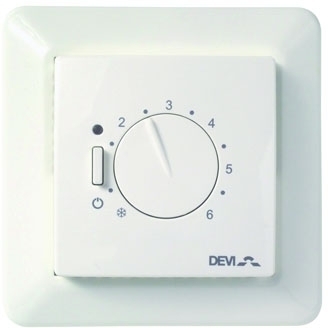 The DEVIreg 530 is used for control of floor heating installations. The thermostat is equipped with a floor senor for control of the desired floor temperature. Just what I expected it to be. They had a informative ,easy to use website and delivery time was excellent. Our free next day delivery is a fantastic service that we are able to offer our customers. I think it would be best to contact us for technical advice on 01473 559087 (ask to speak to Karl) and we will help you sort this out. If there is ever a query on how to use one of our products, please do not hesitate to contact us directly as we are more than happy to help with our expert technical advice. excellent service and speed of delivery, also invoice sent by e mail very efficent. Thank you for your great comments, they are greatly appreciated. An easy enough to install, clean looking, easy to operate, simple floor-temp sensing thermostat. Competitive pricing, no problems with payment, timely delivery with goods in excellent condition. A service second to none! What more could you ask for? I am really pleased that we were able to offer great service to you, and that you are completely satisfied with your DEVIreg 530 floor sensing thermostat.